I like this book a lot. I read it as a description of Obsessive Compulsive Disorder (OCD) but of course it is much more than that. It is a story of loneliness, of love, of despair and self loathing in someone who, to the outside world, seems talented and harismatic, but someone whose mind is forever unquiet. Nao (pron ‘now’) Brown is an attractive young illustrator and toy designer whose half-Japanese looks recruit a fan base of young suitors to whom she is blind and aloof. She feels unlovable, bad, evil, for she is tortured by intrusive thoughts and mental images of doing harm to those she cares about and those she feels a need to protect. She feels she can never have children as any situations of responsibility bring on a terrible anxiety in her: she will lose her self control and act out her violent obsessions. The art is exquisite: pencilled lines and watercolour. The expressions and poses are complex, subtle and faultless. The breakdowns are varied and easy to follow. The production of the hardback is lovely: a double sided dustjacket over an artily embossed white cover, crimson end papers with the text block edge coloured the same hue. The book is a lovely object. The main story- Nao’s search for a job, love and peace of mind, is interspersed with pages that document a story from a fictional japanese anime, Ichi, the story of Pictor, half boy half plant, supposedly drawn by (fictional) Gil Ichiyama, Mangaka & Anime director, which resonates throughout the book. These pages contrast markedly with the main story, being drawn with clear lines and flat colours. Dillon does a good job of catching Nao’s rather rigid logic, which divides the world into good and evil (a common theme in OCD) and the sudden intrusive thoughts of violence that assault her consciousness.OCD is a condition of doubt, of being subjected by ones own mind to outrageous and distressing situations of horror which, while obviously emanating from the mind, makes one despair of oneself for having such thoughts. Blocking these thoughts out is impossible and the sufferer writhes in a world of torment and self doubt, unsure as to whether they might suddenly lose self control and act out the scenes, despite the fact that they may abhor violnce and have never been violent in their lives. Nao keeps the cutlery draw locked in the flat she shares with her friend Tara, presumably to reduce the anxiety that she may suddenly seize a knife and use it on an unsuspecting friend. Mental rituals are used to self soothe- repeated mantra’s: in Nao’s case the phrases ‘Mum loves me’ or ‘Mum knows I’m good’. These rituals form the compulsive side of her OCD: her rituals are all mental, whereas in some people, the compulsions can take the form of physical actions, verbal annunciations, counting exercises, tics or practical procedures such as hand washing or cleaning. The goal is of these compulsions is preservation of sameness, a placatiion of the gods or demons to whom one is slave, a warding off of disaster caused by oneself, for the world is vulnerable to ones own actions and thoughts, and lives may be laid waste if one is not constantly vigilant. Fans of Justin Green will note the references to his 1972 classic Binky Brown Meets the Holy Virgin Mary which documents his own OCD, which took on a religious bent. A photo of Nao as a child shows her in a ‘home made Binky Brown T shirt’ and later, during a moment of extreme mental dissonance, Nao seeks to calm herself by concentrating on a Binky Brown vinyl toy. This is an excellent graphic novel, driven by an interesting character. The story is strong, and the mental distress adds depth and interest rather than dominating the narrative. Dillon wisesly avoids over explanation: Nao briefly relates the way in which her condition affects her but there is no lengthy disquisition on the subject, a common trend in graphic novels which seek to inform as well as entertain. 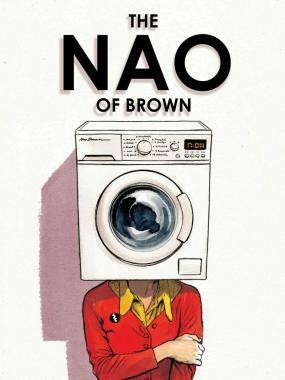 I wouldn’t hesitate to recommend The Nao of Brown.